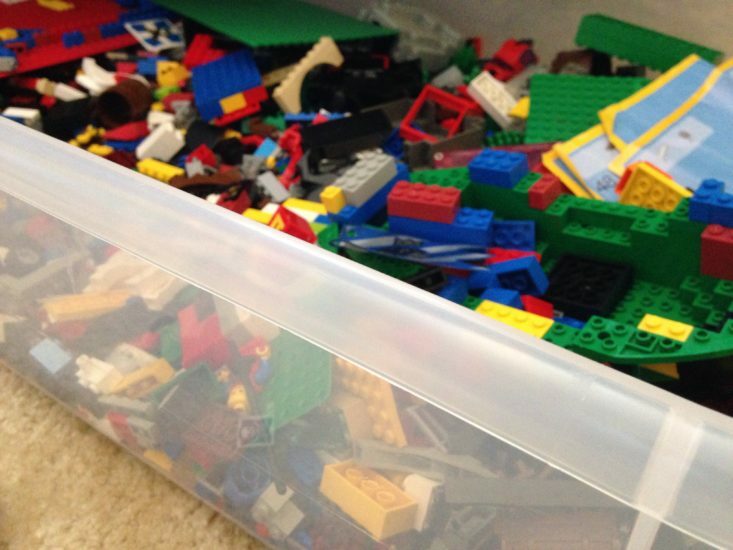 Inside: Are you frustrated by your current system for organizing LEGOs©? 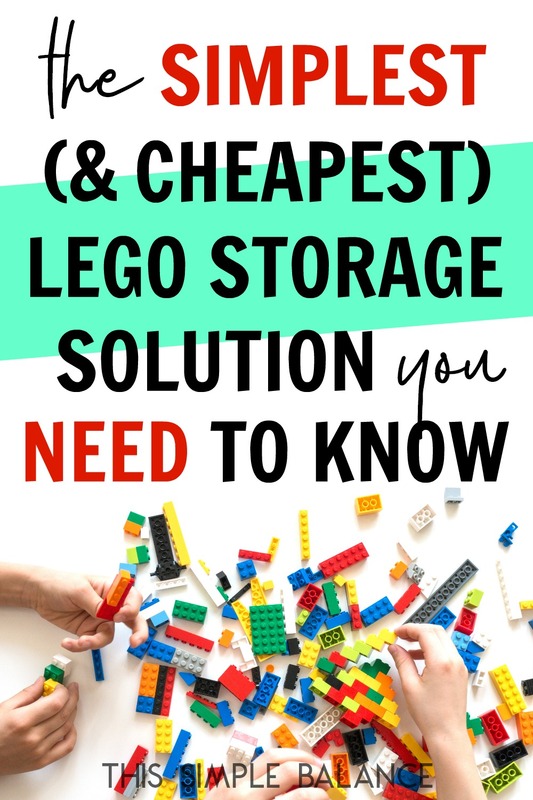 Try this simple, cheap LEGO storage solution instead! We recently inherited my younger brother’s LEGO collection. I’m talking thousands upon thousands of LEGOs, and that’s after giving several sets away to my sister. I have never seen so many LEGO people and accessories in one place, and my first thought was “Why oh why did I take these?!”. I spent the past two years decluttering toys, and the thought of adding so many at once was slightly overwhelming. But once we took them home, I haven’t regretted it once. 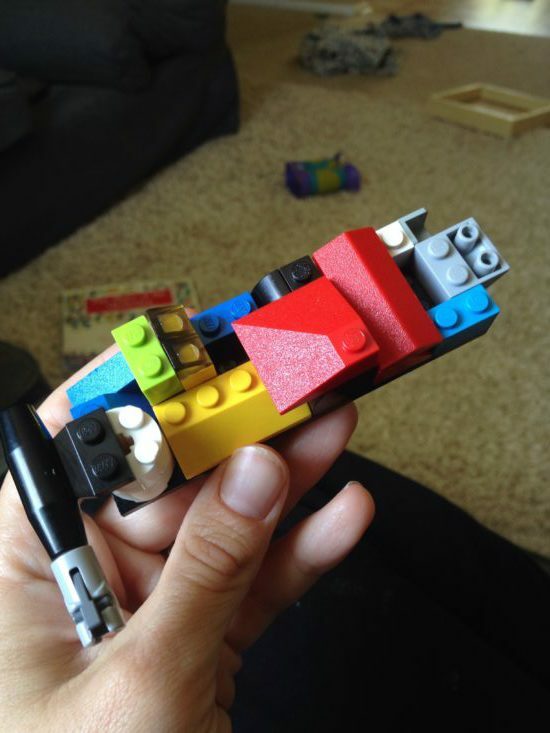 LEGOs are a classic and versatile toy that will last forever. My next thought was, of course, how the heck am I going to store all those LEGOs?! We had a small bin of LEGOs before, but that small bin was nowhere near big enough for the collection we have now. I had momentary, glorious visions of LEGOs sorted by color, a drawer for each one – like this one. You know, the ones made for A-type moms like me who adore beautiful storage solutions. Then, an image of thousands of LEGOs being dumped onto the floor cross my mind. I imagined the pain of stepping on those LEGOs (have you ever stepped on one? curse words have flown across my brain, and thankfully not my mouth). And I envisioned carefully sorting the thousands back into their color coded drawers…again and again and again. I abandoned that idea pretty quickly. I definitely needed to think outside the box on this one. Having just read The House That Cleans Itself, I started thinking about a storage solution that could actually work for their habits, not mine. 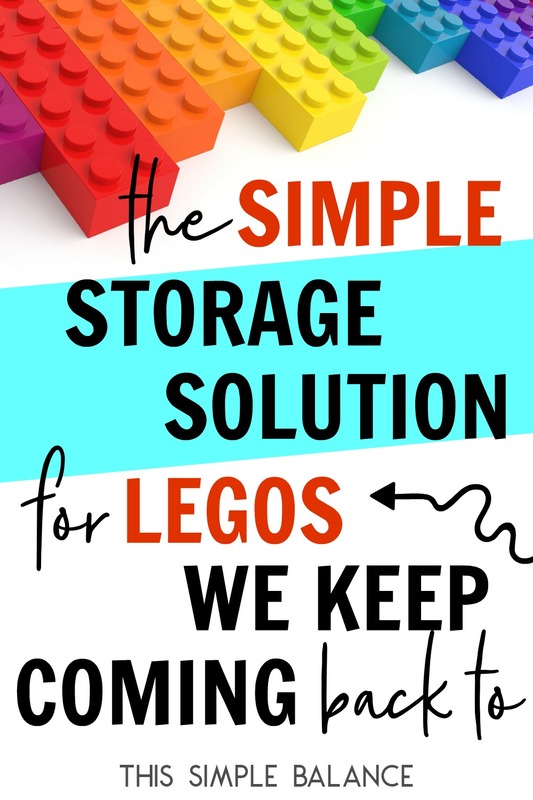 Before rushing to purchase a storage container, I stopped to observe how my kids play with LEGOs, and I thought carefully about how I wanted them to play with LEGOs. I value creativity in play and believe that building with LEGOs can be a great tool for learning. Building the sets according to the directions does not really foster that creativity I’m going for. Building sets does teach other things like patience, perspective, counting, and perseverance, and we did reserve a couple of carefully preserved, whole sets for when my daughter needs a longer building project. In general though, I wanted the kids to build new creations that challenged their spatial reasoning and engineering skills. My three-year-old is constantly coming up with ships like this one. After careful observation, I landed on what may be the cheapest, simplest LEGO storage solution on Pinterest to date. Short of leaving them in the cardboard box, you can’t find a cheaper solution. This container was only $17.99 at Target, and I’m sure you can get it cheaper on sale or with a coupon. We can carry the entire collection from room to room, though up and down the stairs does take a bit of effort. That way, when one of the boys wants to play with them during rest time, we can easily shift them from the play room to their room. 2) It fits under beds. We live in a relatively small house, though nowhere near as small as our apartment in Boston was. When we need extra floor space, the bin is designed to fit under beds. Perfect! 3) Multiple kids can sort from all sides. When the LEGO collection is put in the middle of a room, several kids can look at the same time, a couple on each side. 4) It never gets dumped. With our old LEGO bin, the bricks were constantly being dumped out in order to find whatever piece they were looking for. Now, they never get dumped. There may be a handful of pieces scattered next to it (I’m thinking of a solution for this one). But these can easily be tossed back into the main bin. Previous Post: What if my child never changes the world? I’ve been meaning to comment on this post since you published it and am now finally getting to it, sorry! I seriously laughed out loud when I read “Lego inheritance overwhelm” cause that’s what we have, we have a lot of my husband’s huge Lego sets from when it was young. I’ve never had a name for it but now I do! I think this is a brilliant storage solution. I hadn’t thought about the benefits of a long container that isn’t deep. Now I’ve got to go a measure and see if we could fit that under one of the kids’ beds . . . The shallower option is seriously the best. I got a second one for our duplo blocks too. Before, we had them in a tall bin, and they were dumped every single time. And the sheer number of them were super overwhelming for the kids to clean up again and again. We have the same results with the Duplos – almost no dumping because of the shallow container – they can easily sift through to find what they need. I hope it works for you! 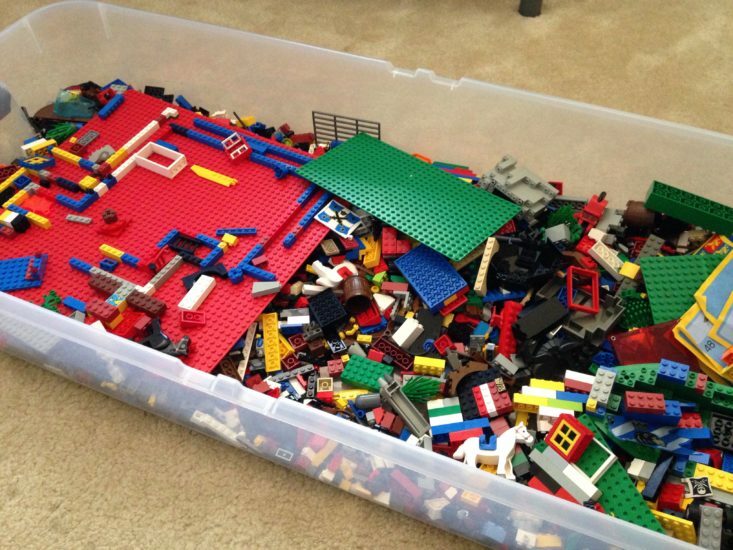 I may get a bigger Lego tub for my kids, maybe they wont dump em out? Right now we have a clear “sweater size” Sterilite tub with lid, for each child. And I got a bunch of orphan lids from big Rubbermaid containers (FREE at Target:) that they put completed projects on, and it is all stored on a cheap wire shelving unit in their room, each child has one shelf and that limits how many completed projects they have at once. Also, they often use simple Ziploc bags to keep the unfinished project, pieces they need, etc, separate rather than dumpibg them back in the bin. NOW, if someone comes upwith a solution for the awful sound of them raking through these things constantly, please share!! What a great idea! I love people who aren’t afraid to ask for free stuff. 🙂 They can always say no, right? 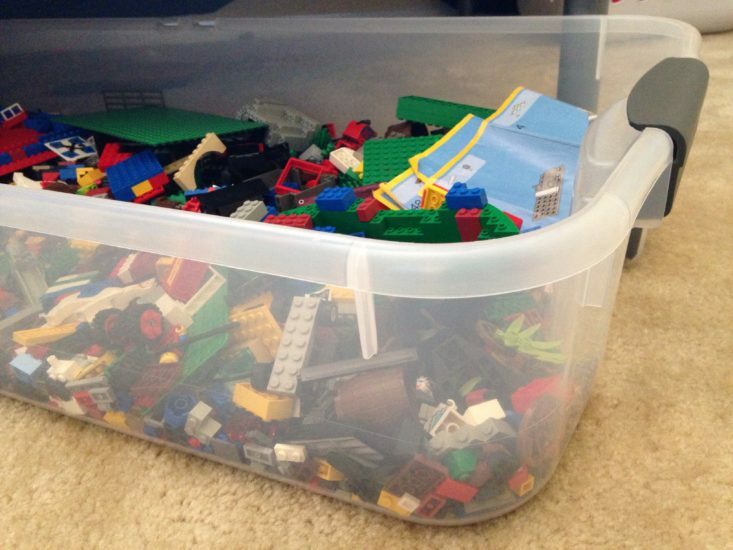 I use a plastic storage tub for our Legos and I love it. This is one of the best ideas ever! Thanks Tanya! Sometimes the simplest solutions are the best, right?